LA Foodbitch: MO-CHICA – mindblowingly good! 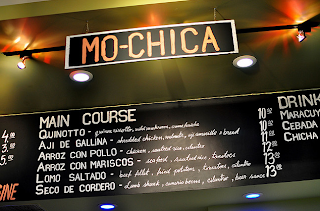 Mo-Chica is a fantastic Peruvian restaurant owned by chef Ricardo Zacate, a Lima native who sept most of his adult life cooking in high-end Japanese restaurants all over the world. The simply styled restaurant is part of the Mercado La Paloma complex south of downtown, and they have the best ceviche: cubes of sushi-quality fish in a thick acidic emulsion sharp with chile, soft and tart and spicy all at once, served with slivered red onion, giant-kerneled corn and a soft chunk of sweet potato. This is the best high-quality Peruvian seafood since Nobu. But there is much more to Peruvian food than just ceviche. The Japanese, Chinese, Spanish, African and Inca influences show in earthy, sensual and unusual dishes like ‘Aji de Gallina’ a chicken stew in a spicy, nutty cheese sauce. There’s no way around: you have to check it out for yourself. I promise, you will not regret it. I am always happy to discover amazing chefs that come up with new, intriguing ideas like Miguel Sánchez Romera, an Argentinian-born neurologist from Barcelona, who won a Michelin star in his quest for food that satisfies your brain. 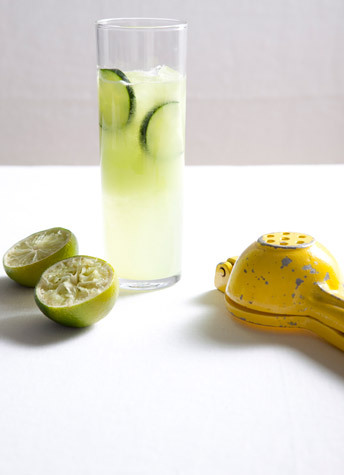 LA Foodbitch Recipe: AGUA FRESCA – QUE DELICIOSA! Peel and seed cucumber and cut into chunks. In a blender blend cucumber with remaining ingredients until completely smooth and pour into a glass pitcher, chill, covered. Stir before serving. Dreaming of a rustic meal like ‘Aelplermagronen’ in an alpine chalet! Peel and dice the potatoes. Boil in salted water. Add the noodles shortly before the potatoes are done (read the directions on the package first). The potatoes should be soft. Drain and arrange in alternate layers with the cheese in a deep baking dish. Pour in the cream and place in the hot oven for a few minutes until the cheese melts. Meanwhile, melt the butter in a skillet. Slice the onions and saute until they turn light brown. Spread over the noodles and potatoes. Serve with apple puree or salad. Cut eggplants in slices, about 1/3 of an inch, brush generously with olive oil. Place the slices on a baking sheet and bake them on both sides for about 10 minutes at 400 F until a golden crust forms. Let them cool on a paper towel. Cut cherry tomatoes in halves, place them into a heat resistant dish, drizzle generously with olive oil and bake for 60 minutes at 200 F.
Sprinkle with fleur de sel and the aceto balsamico, roast for another 60 minutes in oven, let them cool. Place one eggplant slice on 4 individual plates. Add tomates. Cut chèvre or bufflao mozzarella in slices and individually place on top of eggplant. Add basil leaves, fleur de sel and pepper from the mill. Sprinkle with a little olive oil. Repeat until all ingredients are used. Serve at room temperature. While shopping in Europe, I discovered something I would like to be able to find at every food store in L.A. Pure, fresh whipping cream as well as sour cream with only 18 to 25 % milk-fat. According to the California Milk Advisory Board there is a product called ‘light whipping cream’ with reduced milk-fat, which makes me wonder why I can’t find it in the refrigerated shelves of food markets. So far, I have only been able to get the ‘heavy whipping cream’ and regular sour cream. Dear dairy buyers, please get us some of the light stuff for all of us to indulge without the calorie overload. Many thanks!